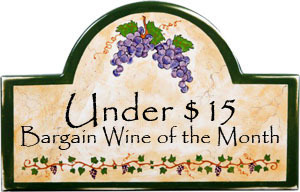 He said: A bargain Pinot Noir. Clear sparkling medium red color. A light cherry/sweet berry bouquet that carries into a smooth taste that had just a tiny hint of sweetness on the first tasting, none on the second. Even with the bit of sweetness it finishes with a dry earthy flavor that is medium length and a little disappointing after the taste. However, at $4.99 this is an outstanding buy for a Pinot. The label says “lush and velvety” and believe it or not that’s not to much of an exaggeration and it’s much better than a many of $20-30 bottles of Pinot I’ve bought. 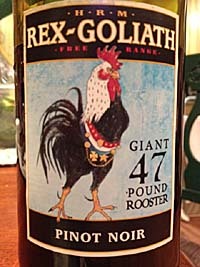 Rex-Goliath Pinot Noir gets a thumbs up as an outstanding good buy. She said: This is an exceptional wine. No, it’s not your usual Pinot Noir but it is good, “lush and velvety” as the label claims and has no bad tastes or sweetness to cover up flaws. It is much heartier and full bodied than you might expect and is a great inexpensive wine if you are okay with a novel Pinot Noir. 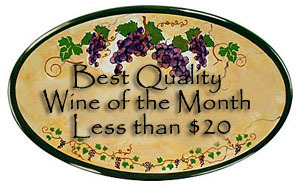 My daughter-in-law likes it better than Pinot’s costing five times the price and she has a GREAT nose for flavors. Comments: Beware there is no vintage provided and until you taste it you will not know if this is actually the same wine being described here, e.g. we found no (zero) sweetness in the second tasting. However, it should be noted that I bought several more bottles and it’s the same quality when purchased in North Carolina or California…Rex-Goliath has a GREAT formula for their Pinot Noir!! !